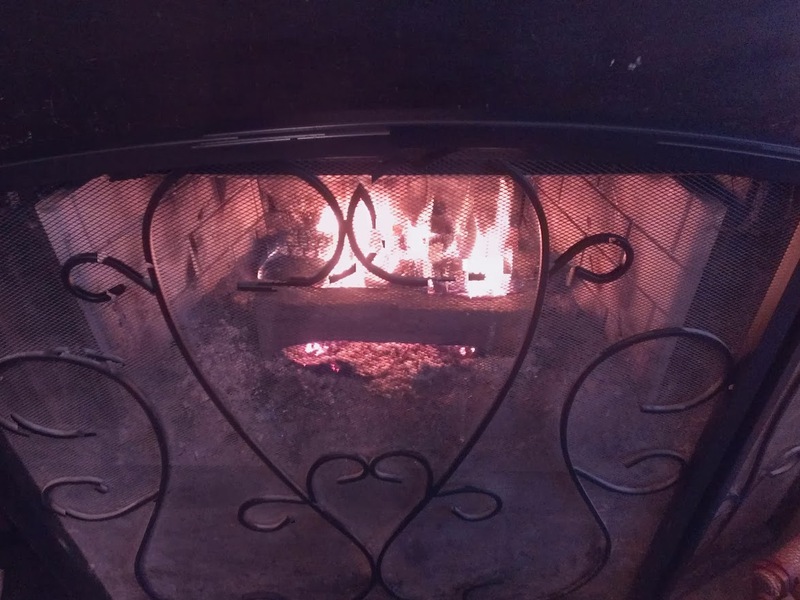 It’s been quite cold (for where we live) and that means the fireplace is happy! But it’s not, because we don’t have well seasoned wood. Ha ha ha, joke’s on me. It makes me not happy because it’s more than a chore to get a fire hot for the morning, or all day, as needed. Season’s first fire, wood we had left over, so it was pleasant to use. It’s been cooler of late, and since yesterday rather a smokey smell to the air. I looked at alerts yesterday, but I only saw one for NC but assumed it had to be associated … there is an alert today for us today, FWIW. I want to make a chewy molasses cookie, snowballs (russian tea cakes), and so many more cookies. An old favorite of mine, not a cookie, a savory snack, Olive Cheese Balls. A simple cheddar, flour, melted butter dough wrapped around a pimento stuffed olive, the small variety. I really love this during the Christmas holiday, but no one else is a fan. Quite disappointing. So this time I will make them, but ahead, freeze, and only bake enough at a time. Then I can enjoy them longer, or maybe someone else will end up liking Olive Cheese Balls. That brings me to oh, I should make a Cheddar Cheese Ball too. Previously talking about the Olive variety, that is a flour, butter, and cheese dough, and baked, while a Cheddar ball is cheeses, and more, not baked. 🙂 Pimento Cheese is another idea to employ. I would highly prefer to make it, never buy it again. Super Grin at that. Things that need to get done make it harder this year. We had an old piano sitting in the house, moved it out recently, and now the bare floor needs worked on. We have about 3 rows of hardwood to put in. We did one yesterday. Hopefully we can swing the rest of it today. That is where the Christmas tree, awaiting our beckon, is going to be. It’s in the garage for now. Only so many days left, not that many, but I hope to get the feeling akin to “it’s working”, sense the magic. We need to get our fireplace and chimney inspected. Yes, we burn wood every year. No, never have had it swept. Bad, bad, bad. 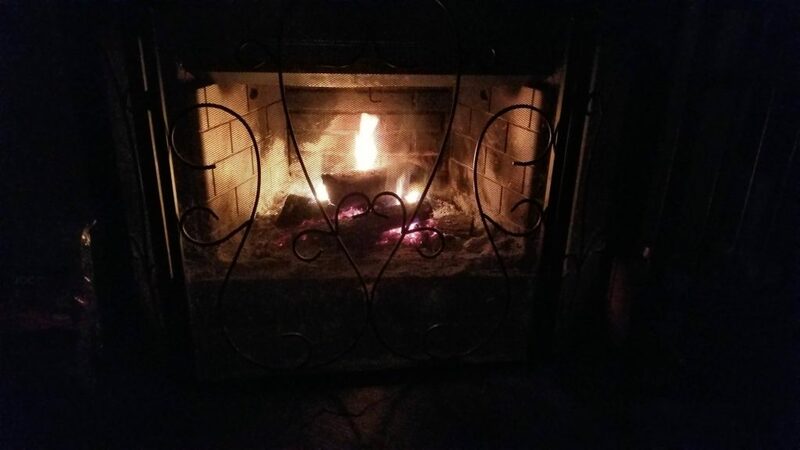 Our fireplace has 3 panels of fire-whatever it’s called. The back one is cracked near the right side, and only recently we noticed that the left side is worse than that, crumbled and missing pieces, left bottom corner. I was moving embers around the other day when I noticed something, got a closer look and my spirits sunk to nothingness. No more fireplace. Winter is dull and lifeless and meaningless to me without a fire to tend every day. It’s been raining a lot lately. Thunderstorms, warnings, flash flood watches, etc. Last year it was like this around now. Both in 2012 and this year we had rain on the 4th of July, but windows of no rain opened up to let us do our fireworks in the evening. That is so awesome! July is the mid-point of the year. Both my husband and I were born in July. I consider it a really good month since it was the only month always free and clear of school entirely, so summer, so holiday and so free. The promise of the rest of the year being great is ahead. Nothing is impossible. I have had a migraine since yesterday. I woke up with signs of it on the 4th and battled it all day. I had it well enough beat down to function outside with the fireworks (the most fun there is!) but was miserable afterward. I was able to get to sleep after midnight, woke up sometime after 7AM. Didn’t feel so bad, took some meds (over-the-counter) just in case. Get up, get coffee, within a half hour, here it comes rearing it’s ugly head again. It wasn’t gone. It was backbuilding. I felt so sick and miserable all morning. Nothing touched it. I forced myself to eat some macaroni and cheese and felt SOME better, getting an appetite for it as it heated up. Otherwise I had hardly eaten anything all yesterday and today. It’s really good. My daughter is making it (for the first time all by herself, for me.) Thank you! 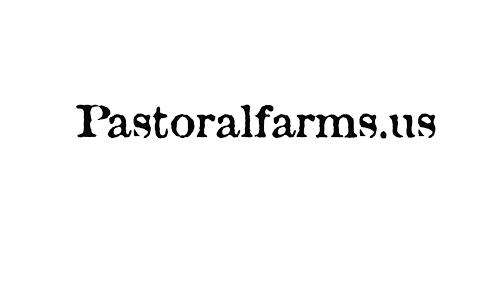 This is why I put some recipes on this blog. I need to do more of them. The Summer has blown by. Autumn is close, and it feels that way. One tree we have has a lovely orange-red leaf on a branch visible through the kitchen window by the sink. I’ve seen a few turned leaves on other trees, many trees shedding their leaves (My Yoshino’s have been doing that in August … not always, but the last few years, yes.) The gorgeous Japanese ‘Bloodgood’ Maple in the front yard has tired looking leaves (more green than red, as they get in the Summer) but their bright blood-red seed pods are getting bigger and brighter, and it won’t be long until the leaves regain that bloody red color and get into their gorgeous deep burgundy autumn splendor. The sky is filled with layers of clouds, yesterday we had a large swath of buttermilk over our area, but not as far as the eye can see, it was limited, with plenty of puffy, or flat, fanned out, other clouds all around. Later there was evidence of a high level scant buttermilk pattern several miles away from our morning buttermilk. The Summer heat has dissipated, it’s still hot a-times, but the one-two punch that is Summer’s Thing is thin, at best. Mornings are warm, but gentle. I love the idea of Summer, it’s a fantasy world from my childhood in Pennsylvania, it gets hot, but MOST days not too hot, not too humid, just nice, nice, nice! Summer … my favorite. Except for I hate HUMIDITY & HEAT as the SOUTH gets, but at least where we are now it’s not ALWAYS HOT, like it was in Florida, where we moved when I was 13, when life took a decided turn to cynical attitudes for me. Naturally disposed to such, my lessons were harsh and that’s not what this post is about, it’s just my explanation for why Summer is a fantasy world kind of thing for me. So we are coming upon my favorite time of the year in Georgia. It gets cooler from here on out, and sometime in November or December I can start setting fires in the fireplace. I have enjoyed that part of living here so much, and last year I stepped it up getting into a stacked Top Down methodology. This will be my second year, So it’s 2.0 … I will figure out a name and reasoning for 1.0 and 2.0 … of course there is a 1.01, and a 1.3, I’m thinking this year will be a major upgrade, so it’s 2.0. Okay, bring on the chill! 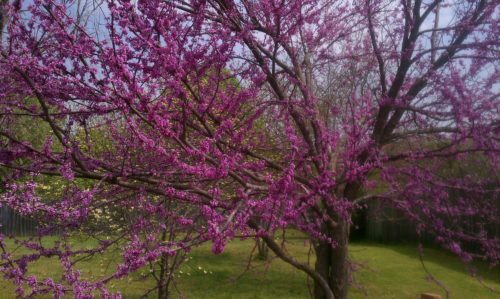 Eastern Redbud in Full Bloom, a photo by CrazyMaisy. This is a partial view of our Eastern Redbud tree in the backyard. It’s in full bloom, has been for a few days now. It’s absolutely gorgeous. The trunk is visible, somewhat. It’s twisted around like that due to a dog we had chewing the sapling to a nub, then I let it regrow and it grew two distinct trunks, I trained them to curve around each other. I really like the look, and it’s only like that due to a dog. I guess others would have given up on it, but I don’t cull unless there’s a really good reason to. This being the only Redbud tree we have, it was worth it in the end. The tree on the left is past peak already, and the ones to the right are right at peak bloom now (started yesterday afternoon). Usually these trees are in sync with their blooming periods but the one to the left was way ahead of the other two this Southern Spring March 2012 with first blooms opening March 10th. Well, January is well into way, closer to the end than the beginning, but it’s not even Winter here anymore. It should be, though it’s not. It’s been very rainy, though it was forecasted that would be the case, a more mild winter, but overall, it’s too much like that. We’ve had two thunderstorms this year, major thunderstorms, many rain storms besides those too. Today it was really rainy, quite rainy, hard, hard, hard, lots of thunder & lightening. Booming, wonderful thunder. Today I remembered seeing daffodils springing up somewhere we’d been a few days ago, and so that sparked me to go out when the rain let up a bit and look at where mine are. Surprise, surprise, mine are coming up too. I was thinking that maybe the ones we’d seen had been planted by a landscaper (you know, commercial area, throw away plants or perennials? Hard to say unless you stake them out forever.) So anyhow, there are mine, some here, a few inches high, some there just peaking out, some other there, a bit more than peaking … tomorrow there may be more. That’s early. That’s OK, but it’s not exactly something that has me at ease, I’ve seen what a late frost can do (April 2007) and this is way earlier than then, how it was in early spring (the still official winter by just a month! spring this year to compare to the early spring that year being into February …) usually spring happens in March, maybe signs in late, late February, but that’s what’s normal, March gives way to much blossoming and April even more and green leaves galore. So we had it all happen a few weeks early last year. Now this year, even earlier. Just cyclical weirdness. The U. S. A. has that all the time, has always, since before records were kept. Don’t quote me, it’s just my understanding of it, from billions of areas of life, not just one source, not source-able past that. Weather has been nicer atimes the past couple of weeks. The hold that Summer has is slipping, Autumn is in the air just a bit, length of days, feel of the Sun, how the plants are getting ready for the change, good old crisp, clean air is coming. Eventually. Wow this month has gone fast! Now the Dog Days of Summer are beginning. Hot more often than not. Sun strong, not quite as light as late as it was in July, but this side of the sun’s courses through the cosmos are the hot-dog ones, whereas May and June are just wanna-be’s. Why does this have to happen? I’m not sure what it’s doing, but the main thing is, the SUN. It comes up in the East and blasts away at the back of our house all morning and into the afternoon. Our bedrooms are on the top floor. No tree cooling up there. Master bedroom is at the back of that whole area. It gets so hot in there. Without A/C it’s 100 in there in the middle of the night. With A/C the thermostats are set to 68/69 everywhere. When the system has been restarted with my methodology, which is turning everything off, then turning ONLY the Master Bedroom thermostat on, then the bedroom starts cooling down ever so slightly, then more. Overnight it returns to it’s “schedule”. The Main Floor thermostat does well then, turn that on and it quickly brings things to right. The basement area is then the question, the “office” (my craft/computer area) is decent, the hallway is where the thermostat is. The big area at the back of the basement, behind interior french doors, is much warmer always. When the thermostat for the basement is turned off, that big space gets too warm (for my tastes) while the other rooms are OK for the most part. When I turn that thermostat back on the air in the big space gets better, but still, it’s ALWAYS much warmer in there compared to my office, or the hallway. After 1 or 2 days like this then, the Master Bedroom thermostat really starts struggling. Lets put it this way, the first day after resetting it all, it starts out with the thermostat keeping things OK until somewhere around 2pm it’s behind 1, 2, 3, 4 or more degrees. As the day wears thin it gets closer to the scheduled temperature, overnight rights itself. Next day or the day after that is when it gets too thick, warm not good in my bedroom early in the day and never recoups, so if I haven’t been up there, I go to bed and oh, bleh, blah, no!!!!! We are talking it is supposed to be 68 and the thermostat registers the temp at 78 or more when it gets to the place where I HAVE to turn it all off, then slow on. It’s not like 68 is too heavy of a load. It’s not that it has to be “68” but that is what the thermostat has to attempt or else this entire process is TOO MUCH for me to live with. To get rid of humidity, must run A/C, A/C only runs when it needs to cool based on it’s goal temperature. If the temperature is set to 72 that’s too warm. It’s like letting it all get it’s toes in the doorway, you think the door is closed, but it’s not, and the thing you mean to keep out is coming in. This all means so much to me since I get so miserable easily when the temperature climbs about 70 degrees much. The further it goes in that higher direction the larger the impact it has on me. So, 68 is my primo position of a trade-off, I’ll let it go that high for you others. I’d much prefer to live in the North Pole. I posted this photo to Flickr the other day. It’s the related to the previous post here, the same plant as the one in the photo of a green shoot coming up through the dirt. There are many more shoots coming up now, over 70 (not quite half of what was planted, yet.) and 4 are flowering today, with a few more that look like they will be flowering by tomorrow. We got over 5-inches of snow from somewhere around 10pm through to the morning, Sunday, January 9 to Monday, January 10, 2011. The snow came down thick and fast for a long time fastly sticking and building up. I’m seeing this as the best snow storm we’ve had since moving to Georgia in 1997.